Tony Blair, Oprah, Thomas Friedman-this week's link review turned out to be a bit of a 'celebrity issue' and as often, I don't mean it in a good way...but there are also some interesting critical nuggets on the power of failing, on what makes a good NGO and one of the downsides of collecting lots of data with little context...and there's even more on ethnographic pedagogy and predicting conflict using WikiLeaks material! If you read the full GUARDIAN piece and basically replace 'Olympics' with, say, Millennium Villages, you would be criticised left, right and centre, because Blair uses a jargon that partly seems to be straight out of a World Bank infrastructure project document of the mid-1980s. His ramblings also show what a huge and sometimes ridiculous amount of pressure is put on today's development work to demonstrate (short-term) impact and how it is often treated very differently than other public policy areas (sometimes impact really takes 10 years to surface). We're getting this Camera Giveaway Contest started! Upload a photo like this one that shows a business or product made in Afghanistan or Liberia. 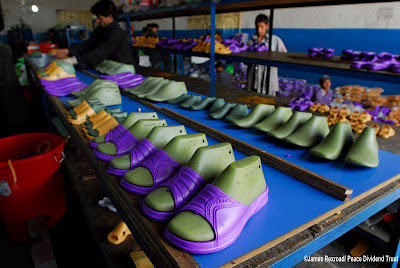 This photo shows plastic sandals made in Kabul. Copyright: James Rexroad/Building Markets As some of you may remember, I have a bit of a development shoe fetish, particular when it comes to sending shoes to Africa. It's good to see things like plastic sandals being manufactured locally! For me, as a long term representative within the culture for all who are outside of the culture, it is embarrassing to see so many of my fellow foreigners demonstrate so poorly the rest of the world’s taste in fashion. Haitians are extremely sensitive to what’s ala mode, whether they can afford it or not and they expect you who can afford a plane ticket to come help them to be able to buy a pair of shorts that at least fits appropriately. So I have compiled this list as a warning of what not to do if you are thinking of visiting this Caribbean country. Please consider this advice carefully while you are packing for your trip. Your reputation and that of our entire race depends upon it. I like the tone of the post because it's partly 'Stuff Expat Aidworkers (dis)like' and partly useful advice, e.g. respecting local culture and customs by bringing different/decent clothes for church. The bottom line is: Even if you are in some kind of 'field' there are plenty of occasions for wearing decent, 'normal' work clothes. The joint family which was dressed in full Indian regalia served her a meal on silver thalis and katoris. She looked at the food and then made her best statement of the entire episode – “So I hear some people in India STILL eat with their hands”. I don’t know what people in America are eating their hot dogs, pizzas and tacos with but perhaps Oprah’s home has evolved cutlery for all that. Then she told her viewers that ALL women in India live with their mothers-in-law and extended family. I watched parts of this programme and agree with Rajyasree Sen that Oprah appeared quite clueless and very 'Middle American'. And I really don't like when India is reduced to the dichotomy of 'Slum' vs. 'Bollywood Billionaire'. Oprah needs some good development advisors asap! What makes an effective non-profit? In my time working with non-profits and international aid organizations over the years, I’ve noticed certain qualities that make non-profits particularly effectively – ultimately for the beneficiaries of the work being done, but also for staff members and volunteers. It's posts like this that Oprah should read before embarking on her next trip abroad if she really wants to get a better understanding about development and organisations that work with and for people and social change! Harsha Liyanage thought farmers in Sri Lanka would be excited about trading via SMS. After two years of development and two years in deployment, he learned that farmers don't trade via SMS. They want face-to-face interactions with local actors. The farmer's wife or children do love modern technologies, and by leveraging their excitement for Facebook, Harsha was able to move from failure with farmers to success with social networking as a medium to connect farming families with new buyers. The World Bank and Climate Change: Forever a Big Fish in a Small Pond? The World Bank also has a problem. Its mission—to reduce poverty through shared growth in the developing world—is increasingly threatened by failures of global collective action on these problems. In this paper, Nancy Birdsall discusses the future role of the World Bank in addressing global commons problems, using the example of climate management and financing to set out the principal-agent problem facing the global development and climate communities. She does so by taking into account the current global climate architecture and the implications of the shifting dynamics of power in the world as the advanced developing countries exercise their growing influence. The problem flatmate who’s always asking for something….. It is hard to see how the data supports what works. At this level of aggregation, the numbers seem too abstract to be of utility for DFID and its partners in learning how to improve programming. Nor do they mean much to UK taxpayers. A recent IPPR/ODI paper suggests that the public is interested not in what but how, not in flat indicators but in more meaningful discussions of the complexities behind aid and how it works. DFID’s indicators are of very limited use here. At the same time the transaction costs and bureaucracy are potentially damaging to the quality of relationships and the demand for easily aggregated numbers risks prejudicing development agencies’ capacity to support transformative development. Look out for how DFID’s approach to ‘results’ is part of a wider trend in the international development sector! Collecting, aggregating and sharing data is not enough-quite the opposite, it can be time consuming and relationship-straining as Brendan Whitty comments on DfID's latest Annual Report. Using ideas from statistics, signal processing, and ecology, we provide a predictive framework able to assimilate data and give confidence estimates on the predictions. We demonstrate our methods on the WikiLeaks Afghan War Diary. Our results show that the approach allows deeper insights into conflict dynamics and allows a strikingly statistically accurate forward prediction of armed opposition group activity in 2010, based solely on data from previous years. Daniel Lende and Greg Downey discuss Thomas Friedman and Neuroanthropology, i.e.what the impact of Friedman on public debates can (or cannot) teach anthropology of being and/or becoming more relevant in complex social discussions. The approach I’ve taken is to use ethnographic case studies and basic texts on ethnographic methods to build a common language for talking about workplace structures, dynamics, and cultures. As my students are engaged in immersive fieldwork experiences, often quite intense, each has a rich body of experiences to process and analyze. Their crash course in workplace ethnography begins with my opening lecture in which I stress the importance of recording first impressions and assure them that much of what initially seems strange or puzzling about their internship site (the jargon, the habits, the pace) will seem natural by the end of the semester. Quite simply, I enjoin students to think of themselves as ethnographers within their internship placements, and help them to see how anthropological methods of participant-observation, fieldnotes, and reflexivity can enrich their experiences. Internships elicit strong reactions in students who have often not experienced workplace culture; many are dazzled by the experience, but just as many are demoralized. Giving them methodological tools to contextualize their experiences can help them position themselves as part of an office, a company, and an entire industry, simultaneously helping them to see their own place in it and giving them critical distance. Their end-of-semester presentations take the form of research projects that require them to read their experiences against secondary sources relevant to said question. Some topics include: a fashion designer’s philanthropic contributions to the Manhattan’s High Line project; the dearth of women writers in comedy TV; the rise of eco-tourism; and (many, many) diagnoses of the slow death of print magazines in the wake of blogs and Facebook. Critical anthropological pedagogy for the classroom! At a time when higher education is being defunded and reduced to adjuncts of corporate power, big sports empires not only provide much needed revenue, they also legitimate governing structures that are primarily responsive responsible to raking in profits. High profile intercollegiate programs legitimate business oriented governing structures because they consolidate power through the merging of big money and big sports. This legimates a neoliberal mode of governing that turns college presidents into CEOs, students into customers, education into a mode of consumption, and faculty into spirited entrepreneurs–all in all a shameful and corrupting view of the university. Moreover, I think that big sports empires on college campuses not only indulge in the deification of coaches who wield a pernicious influence on the governing of the university, it also creates conditions in which students view college as a place to be entertained rather than be educated, resulting in a type of collegial experience that results in a degrading of the intellectual mission of the university. Even though this piece was written before the NCAA's ground-breaking verdict it is a worthwhile read and the debates on the commercialisation of college sports and its impact on academia has only started. you’ll find that Twitter allows the ability to broaden your reach outside your normal audience and you will see increased downloads and greater usage of your paper as a result. In addition, you can quickly update all of your followers multiple times a day, or as often as you are able, offering more opportunities to increase the reach of your research. As this is written by SAGE's marketing people I wasn't sure whether I should promote the post, but is links to a few interesting papers and has some interesting nuggets of knowledge in the post.